The question of how to remove pages from google’s index has popped up twice in conversations with SEO clients in the last couple of days (perhaps fulled by the post Panda 4.0 panic…). The process is pretty straight forward, but one that often causes confusion and is surprisingly easy to mess up. Here is how to do it right and (importantly) to make sure that the pages you have removed don’t come back! Why Would You Want To Remove Pages From Google’s Index? Basically, since google Panda, having lots of ‘thin’ or duplicate content pages on your site can cause problems. Before Panda if a page was low quality it just wouldn’t be indexed or ranked, but since Panda too many thin pages can cause your whole site to be penalised and lose it’s rankings. If the answer is no, then get it out of the index. A lean, mean site with 100 quality pages will perform much better (and by that I mean bring in organic search traffic) than a bloated 10,000 page gorilla full of unnecessary pages. It’s pretty straight forward to find out what google is currently indexing on your site. If I search Top 5 SEO for example, google tells me that it currently has 109 indexed pages. There are currently 88 published posts on this site, so along with the category pages etc that sounds about right. If the figure had been 209 then I would probably want to take a closer look to see what was being indexed. If the figure was 2000, then I would definitely want to take a closer look! This is of course a relatively small site (in terms of number of pages! ), so if you have a larger site then it might take a little while to look through what is indexed and work out whether it should be there or not – but it will be time well spent. So once you have identified content to be removed from google, how do you go about removing it? I Just Block The Pages In Robots.txt Right? This is a mistake that many people make. Blocking a directory (i.e. /search/) in robots.txt is part of the process (and I will cover it later), but it is actually the final step and not the first. Blocking robots from visiting certain directories will just mean that they cannot recrawl the page (it doesn’t specifically tell them to remove them) and you may well end up with old, expired, thin urls just sitting rotting away in the index (and dragging down your site) until the end of time. The first step in removing a page from google’s index is to add the robots meta tag and set it up so that your site instructs a visiting spider not to index the page, but to follow any links contained on it. In theory, the default action of a search spider should be to follow all links anyway, but I normally add in ‘follow’ just to make sure. A quick search (cache:https://top5seo.co.uk/category/seo/page/2/) confirms that google is complying with the request not to index the page. Adding the robots tag should be your first step, but the page won’t be removed from the index until it is next crawled. So how can you expedite the process? If you have the time you can use webmaster tools go through URL by URL and expedite the removal process. Certainly what you should do is remove any directory specific duplicate/thin content problems as this is easy to do. For example you can remove anything with the path yourdomain.com/search/ with one request. Google should then remove everything under that path from it’s index. To remove a specific page just enter the url and select ‘Remove page from search results and cache’. Important: Do not complete this step until the pages have been removed from the index. You can use the site: command again in google to make sure all the content has been removed, i.e. Once it has gone, you can now use robots.txt to stop anything in the directory from being crawled in the future. User-agent all means the instruction is for all robots (spiders) and disallow means that the robot should not crawl any content in that directory. You can use the blocked URLs tool in google webmaster tools (Crawl > Blocked URLs) to verify that the rule is working correctly. So, that’s the process of removing pages from google and making sure they stay gone. Easy right? 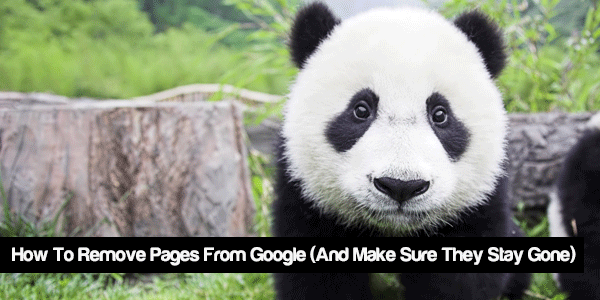 With the release of Panda 4.0 this week, it’s well worth running through this process and getting any unnecessary pages on your site out of the index. Any questions, just leave a comment below and for loads more actionable white hat SEO tutorials, sign up to our free newsletter below! Nice guide, I think this is going to be more and more prevalent in the wake of Panda 4.0… It’s also just good SEO to only index the right pages. Very helpful post, I guess I’ve never tried the removing of pages from google and the reason I think I didn’t cared about it. So I’ll dive into this stuff soon as one of my blog is penalized and traffic is decreasing day by day. Hi David, thanks for the post! I use on my WordPress website a Plugin called PrettyLink. With that I have aliases instead of long links and it allows me to use shorter/clearer links on my pages (for example “http://mysite.com/mylink” instead of a long link with numbers etc.). Do you know how remove them from Google’s index? – they’ve already all been crawled. They’re only aliases that point to external pages: is it enough if I use “href= … rel=noindex” in my code? Perhaps the redirects have the wrong status assigned (perhaps a 302 temporary redirect, instead of a 301 permanent). If you drop me an email to [email protected] I’ll take a look for you.